How to Accept Criticism Positively not Personally? In this never ending quest of trying to be “perfect”, we often end up becoming a wholly different person. While trying to please your family, your boss, your partner, your parents, you can often forget the most important person you need to please; Yourself. While it is always a good thing to improve your good points and get rid of your bad points, you must never let someone else’s negative comments about you bring you down. In the end, it is only you who can decide for yourself what is and isn’t right for you. 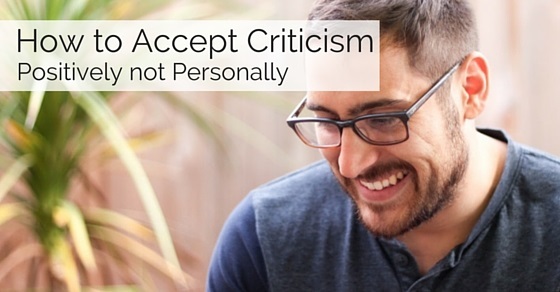 This article will give you a few points to keep in mind that how to accept criticism positively when you faced. The following mentioned are few tips to accept criticism and how to deal with criticism. It is basic human nature, that when we hear something negative about ourselves, we tend to become defensive. Most often, you will find yourself wanting to lash out at the person in front of you. The first and most important key to accept criticism positively, is to hold back on your first, natural reaction. You might want to defend yourself, or even simply point a finger back at the person who is criticizing you. Control this reaction. Instead, take some time to cool off, breathe deeply, and think over it before you lash out at the person. There are many people you will find, who will criticize everyone and everything, whether it is required or not. When you come across these types of people, you must be able to draw the thin line between different types of criticism i.e Constructive and Destructive Criticism. i. You will often face constructive criticism from people like your parents, your siblings, your boss, or your close friends. The thing to keep in mind here is that the criticism you are facing is very often something which is true, and which can be improved upon by you. You must realize that this type of criticism is for your own good. It may feel hurtful at first, but if you take a moment to look into the words, you might find that the criticism would help you constructively. ii. On the other hand, you might face something called destructive criticism. This type of criticism is in no way for your improvement or for your own good. It is simply given by certain people who might think they are know-it-all’s and who get a kind of sadistic pleasure in bringing other people down. Try and shut yourself out to this kind of criticism and people as much as possible. There will always be someone or the other who will find some flaw and try and bring you down. When you learn to believe in yourself and your abilities, these words of criticism will not be able to make you feel low. Letting yourself get bogged down by criticism will act as a catalyst to those negative remarks. Have faith in your own abilities and you will not have to let anyone else’s opinions bring you down. When you are faced with criticism, be it from an unknown person, a colleague, your boss, or your friends, try and calmly listen to their words. This may be easier said than done, but once you learn to allow the initial feeling pass, listening carefully to their words, that will give you an insight not only to their thinking and opinion about you, but also an insight into yourself. When someone is criticising something about you- could be your work, your dressing sense, something about your personality, your personal choices, etc, look into the depth of this criticism. At some level, does their criticism make sense? By changing some minute details, do you think it would affect you in a good way? If you think the criticism could be for your own betterment, go ahead and try making this change in your life. It might just be helpful to you. While you cannot completely reply on someone elses words of wisdom, at times, these words of wisdom may actually come in handy. In the situation where someone gives you a negative comment or criticism regarding something you are doing or saying, ask yourself if what that person is saying is making an iota of sense. Ask yourself, if by altering the habit that is being pointed out to you, would do you good rather than bad. At one point or another, we all have to face criticism in our lives. It is only in your hands how you choose to take it. Taking someone’s words to heart and becoming depressed about it does not solve any problems. Mould yourself to take criticism in a positive way. Adjust your attitude in a way that criticism is like a boost, or a goal which you must make for yourself to get a step closer to your better self. Criticism doesn’t have to mean that there is a flaw which is unfixable. It can mean that there is room for improvement. Keeping this sort of a healthy attitude will not only help you not get depressed by criticism, but will also help you move forward in life. We are, after all human, not God. It is human nature to feel hurt when we feel our efforts have not been properly acknowledged. Accepting constructive criticism positively does not mean shutting yourself out to your emotions and feelings. It is normal to feel hurt, and the first step to accept criticism positively is to acknowledge that you are hurt. Here comes the thin line you must draw between a bruised heart and a bruised pride. Come to terms with the fact that the other persons words have hurt you. Once you have acknowledged this, you can allow yourself to move ahead and give this incident a positive turn. Use their words as a ladder towards the process of self improvement. Although it may seem difficult at the moment when you are caught up with your emotions, once you have calmed yourself down, take a step back, and look at yourself from this other persons perspective. Is there a chance of some truth in their words? It is our nature to exaggerate our own accomplishments, and in doing this we often see the true picture through a veil. As you have read earlier, the first step to accept criticism positively is to control your initial reaction. You may find this rather difficult to do when you are directly facing negative comments about yourself or your work. A simple everyday practice in your life will help you to keep yourself and your emotions in check; meditation and deep breathing. It is scientifically proven that meditation helps a person calm their mind, their body and their emotions. It helps you to get in touch with your inner emotions and control your animalistic instincts. Deep breathing is also proven to be very beneficial, not only for controlling your anger, our emotions, regulating our body and mind, but also helps you overall. Some people, when faced with a stressful situation, practice deep breathing and counting numbers in their head. You can count backward from ten, and once you finish, you will find yourself to be in a better state of mind to deal with the situation. The worst thing you can do is, to be aware of your mistake and try to cover it up. If you know that the criticism you are facing is coming from a right place, learn to accept your fault gracefully. We are all human and we all make mistakes. It will not make you a smaller person to admit that you are wrong and rectify that mistake. In fact, if you admit your fault, it will immediately soften the other person’s reaction towards you, as he might have been expecting you to blow up in self defense. This might be one of the hardest parts, but after you have heard the person out, try and say “Thank You”. Thanking the person does not necessarily mean you are agreeing with their opinion about you or you are admitting to being wrong, it simply means you are acknowledging the fact that the person is taking their time and effort to improve something about you. Now that you have taken the time out to listen, analyze and acknowledge this criticism, mentally make a note of how you can use this feedback to improve. It is a fact that there is always scope for improvement in your life. Take this criticism with a positive twist and use it to improve yourself. Undoubtedly, the most important thing you can do is to not bring yourself down when you are faced with criticism. Learn to take a negative thing as positive criticism and you will find yourself to be happier and more successful in life. Most of all, believe in yourself that in order to achieve perfection in something, you must realize there is always scope for improvement.